Before I begin today’s post about the value alternatives to expensive high end resonator guitars that are available to you I wanted to show you something that is no longer available except used, probably vintage. A tricone squareneck by National as they were originally made with a hollow neck (image right). Some say the best sounding resonator guitar is the tricone. It is also probably the least popular style of resonator guitar. It was the first of the three variations of resonator designs to be invented by John Dopyera for National Guitar and later for Dobro (which eventually re-merged into one company … and years later were bought by Gibson). You can still buy squareneck tricone guitars but they will have a wooden neck. The Style 1 is a beautiful nickel plated brass guitar. If you want to play certain styles of acoustic blues or ragtime guitar, this is a good choice. However if you want this style of guitar but think over $3000 is out of line with your budget, there are other choices. The Recording King RM-991-S Tricone Resonator, Squareneck (left image) sells for $750 and the Regal RC-57 Tricone Resonator round neck (right image) sells for about $740. Both of these have slot-heads for the tuners but there is another model with standard tuners for the round neck. The originals had slotted heads. 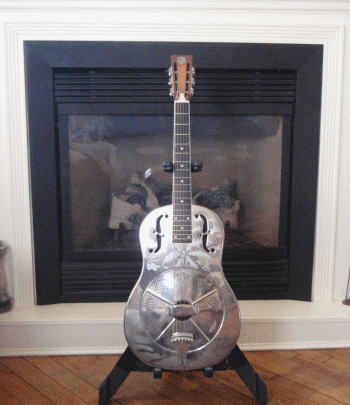 The second type of resonator guitar, and one of the most popular, has a single cone with the apex near the top where the round biscuit shaped bridge rests. I own a Style O model of this guitar from National Reso-Phonic. It has a Nickel plated brass body with Hawaiian scenes engraved on the front and back. An image of my guitar is shown on the right. New, these cost just under $2900 for the 12-frets to the body model as the original was made. The guitar on the left is similar in style but with some difference. A minor difference is the guitar doesn’t have the etched Hawaiian scenes on the front and back. A major difference is the guitar has a steel body instead of brass. I liked the sounds of all the body materials, brass, steel and wood but steel sounds more ‘urban’ while I think brass is more versatile. You save over $2000 compared one like mine. It is Gold Tone Paul Beard Signature Series GRS Resonator Guitar and costs about $885. If you want a brass body instrument, Gretsch’s root series has one for just under $530 (above right). It has a nice MOT headstock 3. A wood body biscuit bridge resonator is also available from Gretsch. This is their Gretsch G9240 Alligator Biscuit Cone Roundneck and is under $400. (Shown on left). The last style of resonator guitar is the classic Dobro which has a metal bridge with eight legs (like a spider) that rests on a resonator cone that faces out instead of in. John Dopyera liked the sound of this design even better than he liked his original tricone. The guitar has been used in all styles of music but square neck versions have become a standard for modern country and bluegrass acoustic steel. The image on the left is the Hound Dog from Dobro which is now part of Gibson. The price is only $400 or so which is a good deal. In a reversal, the imported model, this one from Gold Tone but designed by Beard, is a fancier and more expensive guitar than the one from the inheritor of the Dobro designs. The Gold Tone Paul Beard Signature Series PBR-D Roundneck Resonator Deluxe Guitar is just over $1100. Genuine Paul Beard resonator guitars made in the USA are multiples of this, so the $1100 is still a good value. Weissborn style wood bodied (non-resonator) guitars have hollow necks. Prices are estimates as of Feb. 2015 – your prices might vary.